TOPS (Talent Opportunity Program) is a talent search and educational program for female gymnasts ages 7-10 and their coaches. Please see the USA Gymnastics TOPS pages on their website for more information. 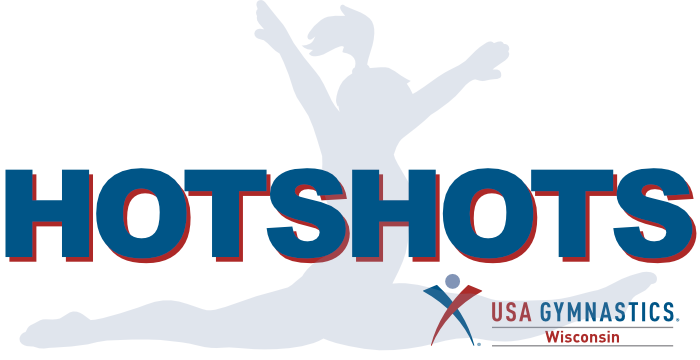 Hotshots is a talent search and educational program for female gymnasts ages 8 – 12 and their coaches within the state of Wisconsin. Hotshots allows athletes one to two years too old (or slightly behind the standard) for traditional TOPS to participate in a very similar program in-state only. Hotshots also allows the uneven bars to be set at settings that exceed FIG settings (If an athlete plans on a future in the HOPES/Elite program or plans to switch back to TOPS in future years… it is strongly recommended that the bars remain at FIG settings). All in-state testings and clinics to be performed by Justin & Audra Slife. Volunteer testers may also be used if a test is large. USA Gym WI will provide all coaches and athletes that participate in TOPS or Hotshots one Wisconsin Gymnastics t-shirt per year. This is only for participants of the TOPS program that qualify through TOPS State Testing. Hotshots participants cannot qualify to TOPS National Testing. This is only for participants of the TOPS program that qualify through TOPS National Testing. Hotshots participants cannot qualify for this camp.